Tips on Traveling with Your Dog – How to keep your dogs safe and happy when you bring them with you on vacation. At Seacoast Pet Sitting we love taking care of all our Newburyport area furry friends while their families go on vacation. However, many of our clients also choose to bring their pets with them while vacationing. Both Anne and I have traveled with our pets including long trips down to Key West and we would like to share our tips and a collection of advise collected from AAA. 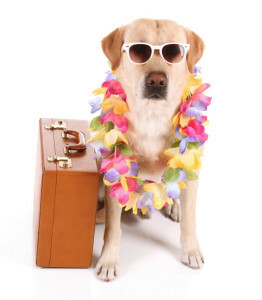 We have also included a few links to pet friendly places to visit and pet friendly hotels. Below is a list of AAA’s advise on traveling with your pet and we have added our comments in purple font. Buckle up. About 30,000 accidents are caused each year by an unrestrained dog in the front seat, according to the AAA. Pets freely wondering the vehicle aren’t only a distraction to the driver, but they’re also more likely to be injured in the event of an accident. You can help ensure a safe trip by restraining your furry friend with a pet barrier, pet seat belt, pet car seat or travel crate. I was actually stopped by the police once in Haverhill and told that it was against the law to have my dog in the front seat. I can’t resist letting my dog stick his head out the window but I save this special treat for my dirt road at 25 miles an hour. Prepare for the worst. Attach a second tag to your pet’s collar that includes the address and phone number of where you’ll be staying during your trip. Also, bring your pet’s medical records along in case of an emergency. Our dogs have micro chips and we both think this is VERY IMPORTANT! Anne found that especially on long trips to Florida the dogs appetite and bathroom behaviors varied from the norm. However this is to be expected and your pets should adjust within a day or two. Don’t leave them alone. On an 85-degree day, the temperature inside a car with the windows cracked can reach 110 degrees in 10 minutes, which can be deadly. If you’ll be visiting a destination where pets aren’t allowed, leave them at a pet-friendly hotel — or at home — instead of the car. Fit to fly. If your pet is very young, very old or not in good health, it’s best to leave the critter at home. Also, some breeds don’t travel well in cargo, such as snub-nosed dogs like pugs, which are prone to breathing difficulties. Many major airlines no longer allow such breeds to fly in the cargo hold. Do your research. Regulations and fees vary depending on airlines and whether your pet flies in the cabin or as checked baggage. Be sure to check an airline’s history of flying animals. Incidents of pets being lost, injured or dying have increased in recent years. Currently, about 15 major carriers provide monthly incident reports to the DOT, which list pet-related incidents. This article was the first I’ve heard of Pet Airways but I’ve never flown with a pet. However, I took the time to look into this and the reviews were not favorable (cancelled flights, etc). When I went to the website they didn’t have a Boston departure and I couldn’t get a quote from another city because it kept telling me there were no flights. Personally I would not fly with a dog unless completely necessary. Pet papers. If you’re traveling outside the country, find out what vaccinations your pet will need and if quarantine is required. Consult this database of animal import requirements for more information. Prepare the carrier. Purchase a kennel that has room for your pet to turn around and stand without hitting its head. If your pet hasn’t traveled before, spend some time getting the animal used to being in the carrier. Airlines have different crate dimension requirements, but the USDA requires the following: food and water dishes, “Live Animal” stickers, upright arrows and bedding. ID tags. Attach contact information to both your pet’s collar and its carrier. I don’t know about this, I usually recommend a favorite toy/blanket/bed. Consult your veterinarian before embarking on a trip, especially if your pet hasn’t traveled before or if you have any health concerns. I have friends who have used these and swear by them. Book pet-friendly hotels, and look for destinations where you’re allowed to take your canine companion or feline friend. GoPetFriendly.com offers a wealth of information on these topics and can even help you plan your road trip. One of my favorite places to stay when traveling with family/pets are Marriott Residence Inns. They are pet friendly, good quality clean - studio, 1 and 2 bedroom suites with kitchen and work stations. Plus I love the complimentary breakfast and some locations have light complimentary happy hour snacks and drinks! We have included a link to another AAA article on the top 10 pet-friendly places in New England. However, we have not been to any of these so we can not give our personal recommendation. Note that I already see comments listing more locations. Please share with us any of your favorite pet friendly hotels/destinations! Previous PostTips to Help Prevent Lyme Disease in HorsesNext PostShould you vaccinate your dog against canine influenza?